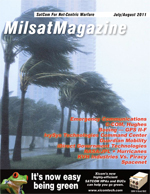 This issue features COMMAND CENTER interviews with leaders in the MILSATCOM world as well as technical articles to assist you with your satellite communication needs. Todays military, government and first responders have a need to understand what the commercial broadcast world can offer to better manage their video and imagery requirements. Now, for the first time, the National Association of Broadcasters has teamed with industry and government partners to develop a conference targeted directly at the defense and military markets, at the worlds largest, digital media show  2009 NAB. In much the same way as the U.S. military forces use communications satellites, the USSR/ Russian military forces are a heavy user of communications satellites. A detailed analysis of the nature of the satellites used by the USSR/Russia indicates, however, that a different approach is taken to meet what essentially is the same objective, taking into account the local requirements. Except for the WGS-1 satellite that was launched in 2007, the current fleet of military communications satellites represents decades-old technology and capabilities. In order to address current as well as emerging requirements for national security objectives, newer and more powerful systems are being developed and deployed by the U.S. Military. These assets include the Wideband Global Satcom (WGS), Advanced EHF satellites (AEHF) and the Mobile User Objective System (MUOS) programs. In recent years defense organizations around the world, led by the U.S. DOD, have been pursuing the means to achieve net-centric warfare, in other words a fully interconnected battlespace with all forces communicating on an integrated, IP-based network. Net-centricity requires seamless communications, and thus the search for ways to increase the speed, bandwidth and power of communications across the battlespace, from ground to air and back, has driven R&D and implementation budgets for true broadband on-the-move capabilities. Karl G. Fuchs is Director of Engineering for iDirect Government Technologies (iGT). Fuchs leads iGTs team of federal systems engineers and serves as chief architect for new product integration as well as the chief technical resource. From earning a BS in Economics from the U.S. Air Force Academy, to the receipt of an MBA from Texas A&M University, Robert Tipton (Tip) Osterhaler has served both his country as a Brigadier General in the U.S.A.F. to becoming the CEO of AMERICOM Government Services (AGS) in 2006. The company moved from a product oriented sales channel into an end-to-end satellite solutions company under his guidance, and focuses on the needs of U.S. government clients. AGS is a wholly-owned subsidiary of SES. The dynamic Vice President of Orbit Technology Group is a retired Admiral who served in the Israeli Navy and, most recently, as Israels Deputy Chief of the Navy. Mr. Yossi Levy joined Orbit as Vice President Business Development in 2005. He added sales and marketing to his responsibilities in 2006 and has been deeply involved with SATCOM for decades. Prior to joining Orbit, Mr. Levy held various senior management positions in the public and high tech sectors and has brought to the company his extensive leadership experience and management capabilities. William Hartwell leads the Federal Markets Division at Riverbed Technology and is responsible for driving the Companys products and services for WAN Optimization and Application Acceleration into Federal Civilian Agencies, the Department of Defense, and the Intelligence Community. Colonel Rayermann was raised in Southern California and started his professional life as an employee of the Jet Propulsion Laboratory. In 1981, he graduated from UCLA and its ROTC program with a BS degree in physics and a commission as a 2nd Lt. in the United States Army Signal Corps. As a company grade officer, he served as an assistant project manager at Ft. Monmouth, New Jersey, then as a planning officer with the 7th Signal Brigade and as the Commander of A Co, 44th Signal Battalion, which used the TRI-TAC communications system he helped to develop. He deployed to Northern Iraq as part of Operation Provide Comfort. by Marc LeGare, CEO, Proactive Communications, Inc. Although Iraq has overshadowed Afghanistan in terms of Coalition resource investment, that has all changed with the new U.S. Administration  communications resources that support that area are now at a premium. In light of this shift in focus, the dilemma at PCI became how to expand our satellite coverage capacity for our customers while still being postured for changes. January 31st 2009, was a proud day for Servicesat. Just 12 months after being approached by one of Iraqs largest TV stations, Servicesat was able to deliver an original, tailor made, low-cost digital broadcasting solution enabling one of the largest TV stations in Iraq to broadcast LIVE in five Iraqi provinces the entire day throughout the Iraqi elections. Military Satcom network engineers need to consider non linear effects of transmissions where signal levels are low or multiple carriers occupy a narrow bandwidth. Non linear characteristics of some Ka-band amplifiers behavior reacts differently to Ku-band and X-band amplifiers, and therefore there is a need to carefully measure the performance of Ka-band amplifiers when selecting for use on Wideband Global SATCOM (WGS). by Steve Kille, CEO, Isode, Ltd.
XMPP, the Internet Standard eXtensible Messaging and Presence Protocol is being widely adopted for Instant Messaging (IM), Group Chat and Presence services in military networks. The U.S. Army is currently deploying its fourth generation Time Division Multiple Access (TDMA) satellite communications terminals to Warfighters supporting the global War on Terror (GWOT). The SIPR/NIPR Access Point (SNAP) terminals are Very Small Aperture Terminals (VSATs) using commercial-off-the-shelf (COTS) equipment to provide secure beyond line of sight (BLOS) communications to battalions and below. Commercial-Off-The-Shelf (COTS)-based satellite communications solutions add to the speed, ubiquity, flexibility, and security of the net-centric enterprise and development of the Global Information Grid (GIG). Most importantly, COTS-based solutions ensure that whether on the ground in Afghanistan, in international air space or managing operations from the Pentagon, the warfighter remains connected  receiving and sharing the information needed to safeguard U.S. interests.